BACKGROUND: Mobility is the ability to move freely and is essential for social activities and participation. Cerebral palsy (CP) is the disorder of movement and posture. These impairments cause limitations in the capacities of the affected child. The purpose of this study is to examine the effect of goal-oriented mobility training on functional mobility scale (FMS), gross motor function measure (GMFM), and capacity and performance qualifier of International Classification of Functioning, Disability, and Health (ICF), and the secondary objective was to study the association between GMFM and capacity qualifier of ICF also FMS and performance qualifier of ICF. MATERIALS AND METHODS: Ten children with CP (5–10 years) were included in the study after institutional ethics committee approval clearance. Children with gross motor function classification system level II, III, and IV was included in the study. Based on the inclusion and exclusion criteria, children were selected for the study. Capacity was measured using GMFM at three items (44, 67, and 70). Performance was analyzed using FMS. Capacity and performance were measured at (d460, d465) domain of ICF. Goal-oriented mobility training was given for 1 h/day for 6 days/week for 6 months to improve mobility. CONCLUSION: A moderate negative correlation exists between GMFM (67, 70) and capacity qualifier and a strong negative correlation between FMS (5 m) and performance qualifier of ICF. Six-month mobility training could improve capacity and performance of children to walk with assistance in home environment compared to school and community setting. Mobility in its classical meaning is the ability to move freely. It is essential for social activities and participation. From a clinical perspective, mobility encompasses locomotion abilities and a range of basic activities, such as changing and maintaining body positions, as displayed in the International Classification of Functioning, Disability, and Health (ICF). Cerebral palsy (CP) is the most common cause of physical disability in children. It is a disorder of movements and posture. These impairments cause limitations in the capacities of the affected child, which lead to ongoing dependency on additional care. Capacity can be defined as the child's abilities in a simulated situation apart from real life. The interaction of the child with the environment leads to the performance of an activity. Functional mobility scale (FMS) measures performance in life situation over three distinct distances, chosen to represent mobility in the home, at the school, and in the wider community. FMS is a reliable tool to assess mobility in children with CP. Performance of an activity according to ICF describes what an individual actually does in his or her “lived experience” or daily life. From the ICF perspective, activity is defined as the execution of a task or action by an individual, whereas participation is considered involvement in a life situation or habits of daily life in a social context. The domain of activity can be separately measured through the qualifiers of capacity and performance. Capacity is the execution of a task in a controlled environment. Performance is the execution of a task in the natural environment, or what the child really does when out on the playground at school, at home, or in the community. The qualifiers of “performance” and “capacity” allow the activity and participation components to classify the presence or severity of a problem in function at the person level within the ICF. Recent research has examined the differences in mobility of children with CP across environmental setting.,,, Palisano et al. assessed mobility at different environment settings that suggest that compared with the school setting, children were more dependent on community and less dependent at home program. According to research done by Tieman et al., children prefer crawling at home environment. Those who prefer to walk with support mostly perform at school environment and those who prefer to walk independently mostly use home environment. Mobility of a child with CP is always a part of discussion in various researches. There is a paucity of literature which focuses on improving capacity and performance of a child with CP for mobility. Hence, the purpose of the present study was to find out the effect of goal-oriented mobility training on FMS, GMFM, and activity and participation (capacity and performance qualifier) domain. Moreover, the secondary objective was to find out the relationship between GMFM and capacity qualifier of ICF also FMS and performance qualifier of ICF. A pilot study of goal-oriented mobility training was conducted in ten children with CP between 5 and 10 years. It received prior approval from the institutional ethics committee. Children with Grade II, III, and IV of gross motor function classification system (GMFCS) level were included in the study. A parent or guardian consent was obtained before the study. Children were selected from the DVVPF's Physiotherapy Outpatient Department. Children were included in the study if they had a diagnosis of CP made by a physician, either gender, cognitively stable, spasticity according to Ashworth scale <1+, can sit independently on bench with foot forming Base of support, and using assistive device (wheelchair/walker/canes/crutches) in different environmental settings. Children were excluded from the sampling frame if they had received Botox or surgery in the last 6 month and any other neurological or chromosomal disorder. Selected children were evaluated for capacity and performance qualifiers according to ICF mobility component. Capacity was measured at the highest of three mobility items of GMFM (crawling, walking with support, and walking alone); these items were targeted as they best correspond to the mobility methods listed in the parent questionnaire (FMS) and they also represent self-initiated movements, which are used by children in everyday settings. The performance was analyzed using FMS, which assesses mobility at different environmental settings (home, school, and community). To improve the mobility of children from indoor to outdoor setting, goal-oriented mobility training was designed looking at the capacity of children. Mobility training includes (1) prone on ball-forearm weight bearing and weight shifting, (2) side sit to kneeling against bolster, (3) straddle sitting on bolster and weight-shifting exercise in all three planes, (4) sit-to-stand with facilitation against bench, (5) cruising facilitation against wall for developing abductors and initiation of weigh shifting, (6) standing on tilt board and reach out in all planes for awareness of movements, (7) walking on uneven surface, and (8) walking in crowded background. Treatment session was planned for five repetitions of required exercise for 45 min/day for 6 days/week to improve gross motor abilities. Scores of GMFM, FMS, and capacity and performance qualifier were noted at baseline before beginning the treatment. It was again recorded after 6 months. Pearson's correlation coefficient was performed to determine the association between GMFM and FMS with capacity and performance qualifier of ICF. Pre- and postanalysis was performed using Mann–Whitney U-test [Table 1], [Table 2], [Table 3], [Table 4], [Table 5], [Table 6], [Table 7]. There were three females with the mean age of 5.6 years and seven males with the mean age of 6.4 years. Children were categorized according to GMFCS level in [Table 1]. There was one child with GMFCS level II, five children with GMFCS level III, and four children with GMFCS level IV. Analysis of the study reveals changes in capacity and performance of children after mobility training. [Table 2] indicates the difference in pre- and postanalysis of FMS in different environmental settings; children in home environment (5 m) have shown a significant difference whereas nonsignificant differences are noted in school (50 m) and community (500 m). Pre- and postanalysis of GMFM component [Table 3], children walking with support have shown a significant difference, but crawling and walking without support has shown a nonsignificant difference. Mobility training has shown significant differences in postcapacity and performance qualifier of movement around different location (d460) and moving around using equipment (d465) [Table 4] and [Table 5], suggesting that mobility training has change activity and participation of children. A moderate negative correlation was found between GMFM (walking with support and walking without support) with capacity qualifier of ICF [Table 6]. And, a weak negative correlation was found between (GMFM) crawling and capacity qualifier of ICF, which suggests that as the impairment decreases in ICF, the score of GMFM increases toward improvement. A strong negative correlation was found between FMS-5 m (home) and performance qualifier of ICF [Table 7]. And, a moderate negative correlation was found in between FMS-50 m (school) and FMS-500 m (community) with performance qualifier of ICF, which suggests that as the impairment decreases in ICF, the score of FMS increases toward improvement in children performance and which was found to be more in FMS- 5m. This study is a pilot study, designed to demonstrate the effect of goal-oriented mobility training on capacity and performance qualifier of ICF in children with CP. In the present study, intervention focused on improving mobility of children with CP. To meet this goal, rehabilitation is designed on the individual developmental needs. The GMFM domain of walking with support (67) suggests that 6 months of mobility training has changed the mobility pattern of children within clinical setting. Those who were crawling initially could walk with a roller walker after training and those who were using a walker earlier change their capacity to walk with cord cane/crutches. Hence, the study done by Salem and Godwin suggested that task-oriented strength training improves functional mobility in children with CP. In a previous study, a task-oriented exercise program that included functional mobility such as sit-to-stand, step up and down, walking, and running had positive effects on leg muscle strength, balance, walking speed, and walking endurance. The cause of nonsignificant relationship in crawling (44) domain could be explained by ceiling effect of this domain of GMFM. And, the nonsignificant difference in walking without support (70) may be because as this domain require more challenging strategies for the required change. Although there was a moderate negative correlation between GMFM domain (walking with support and walking without support) and capacity qualifier of ICF, indicating that the capacity of the children improves with the change in gross motor abilities in clinical or home setting, the change was moderate due to lesser duration of therapy. In previous study, provision of an intervention consisting of task-oriented training to these children improved their walking ability in lesser duration of 5 weeks; this could be due to their analysis include D & E dimension of GMFM, controversially our study focus on individual component of GMFM, which require more frequency of therapy to make changes in capacity. The weak correlation between crawling and capacity qualifier might be attributed to its ceiling effect. The results of performance measure by FMS across different environmental settings indicate a significant difference in home environment; it is observed in the study that it is easier to progress a child from one adaptive device to other in home setting after mobility training compared to school and community, because it is less challenging and more comfortable for the child to accept change in the mobility. Hence, the strong negative correlation is observed between FMS-5 m and performance qualifier of ICF (walking with equipment). Hence previous study has implemented a task oriented intervention in preschool children with CP, which suggests significant improvement in the performance of daily activities and gross motor function. Children had shown a poor improvement in school and community settings in FMS; this finding may reflect the greater contextual demands in the outdoors or community (e.g., varied surfaces, greater distances, time constraints, and safety issues). And, the moderate negative correlation was found between FMS (50m and 500m) and ICF, this suggest that on individual basis post treatment FMS 50 m and 500 m may not indicate statistical improvement, but when correlated with ICF, it showed that a moderate negative correlation might be due to decrease in impairment on performance qualifier of ICF which has an effect on ability of children to participate in life situation. This study provides evidence that 6 months of goal-oriented mobility training improves functional mobility of children effectively in home environment. Treatment techniques to improve mobility of children in community are still very challenging; future research should focus on assessing factors that are exactly interfering with mobility improvement in community before treatment design. World Health Organization. ICF-International Classification of Functioning, Disability and Health. Geneva: World Health Organization; 2001. Hutton JL, Cooke T, Pharoah PO. Life expectancy in children with cerebral palsy. BMJ 1994;309:431-5. Aye T, Thein S, Hlaing T. Effects of strength training program on hip extensors and knee extensors strength of lower limb in children with spastic diplegic cerebral palsy. J Phys Ther Sci 2016;28:671-6. Stein RE, Bauman LJ, Westbrook LE, Coupey SM, Ireys HT. Framework for identifying children who have chronic conditions: The case for a new definition. J Pediatr 1993;122:342-7. Young NL, Williams JI, Yoshida KK, Bombardier C, Wright JG. The context of measuring disability: Does it matter whether capability or performance is measured? J Clin Epidemiol 1996;49:1097-101. Damiano DL, Abel MF. Relation of gait analysis to gross motor function in cerebral palsy. Dev Med Child Neurol 1996;38:389-96. Palisano R, Rosenbaum P, Walter S, Russell D, Wood E, Galuppi B, et al. 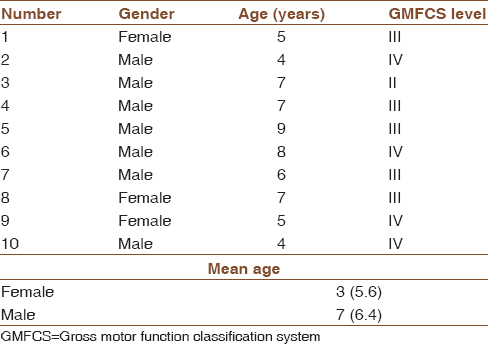 Development and reliability of a system to classify gross motor function in children with cerebral palsy. Dev Med Child Neurol 1997;39:214-23. Harvey AR, Morris ME, Graham HK, Wolfe R, Baker R. Reliability of the functional mobility scale for children with cerebral palsy. Phys Occup Ther Pediatr 2010;30:139-49. World Health Organization. International Classification of Functioning, Disability and Health (ICF). Geneva: World Health Organization; 2002. Bjornson KF, Zhou C, Stevenson RD, Christakis D. Relation of stride activity and participation in mobility-based life habits among children with cerebral palsy. Arch Phys Med Rehabil 2014;95:360-8. Palisano RJ, Tieman BL, Walter SD, Bartlett DJ, Rosenbaum PL, Russell D, et al. Effect of environmental setting on mobility methods of children with cerebral palsy. Dev Med Child Neurol 2003;45:113-20. Berry ET, McLaurin SE, Sparling JW. Parent/caregiver perspectives on the use of power wheelchairs. Pediatr Phys Ther 1996;8:146-50. Haley SM, Coster WJ, Binda-Sundberg K. Measuring physical disablement: The contextual challenge. Phys Ther 1994;74:443-51. Tieman B, Palisano RJ, Gracely EJ, Rosenbaum P, Chiarello LA, O'Neil M, et al. Changes in mobility of children with cerebral palsy over time and across environmental settings. Phys Occup Ther Pediatr 2004;24:109-28. Salem Y, Godwin EM. Effects of task-oriented training on mobility function in children with cerebral palsy. NeuroRehabilitation 2009;24:307-13. Peungsuwan P, Parasin P, Siritaratiwat W, Prasertnu J, Yamauchi J. Effects of combined exercise training on functional performance in children with cerebral palsy: A Randomized-controlled study. Pediatr Phys Ther 2017;29:39-46. Ahl LE, Johansson E, Granat T, Carlberg EB. Functional therapy for children with cerebral palsy: An ecological approach. Dev Med Child Neurol 2005;47:613-9.